Elle Sees|| Beauty Blogger in Atlanta: Odd & Unusual Beauty Masks You've Got to Try! 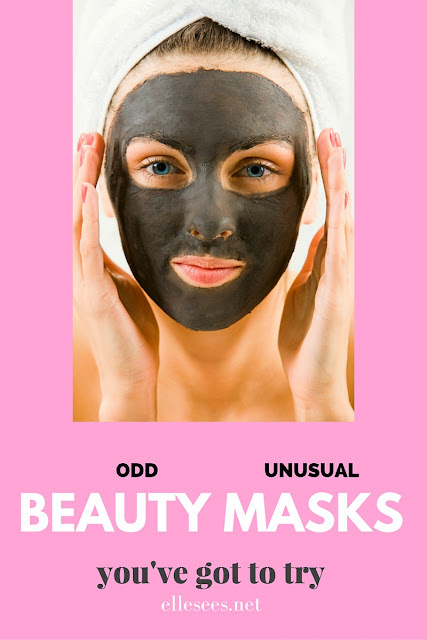 Odd & Unusual Beauty Masks You've Got to Try! I'm a beauty mask junkie. I love making them, something that started when I was little. I remember making a sunburn mask with aloe vera and whatever else I could find. I would put it on my sleeping sister's shoulders, since she was prone to sunburn. And I'm always learning about new ingredients and concoctions, like when I had a bad injury while visiting Costa Rica years ago. I wasn't taken to a hospital, but instead the local women covered me diy treatments that I still use today. You can find my DIYs here. Snail Mask--Snail extracts provide skin rejuvenation. Wine Mask--Retinol is supposed to help with wrinkles. Baby Foot Mask--Fruit extracts cause feet over time to peel, revealing soft feet. Totally gross, but I've been doing these bi-annually for years. Lip Masks--A fancy phrase for either a scrub or moisturizing treatment. GlamGlow PoutMud--$24 (but I diy my own version that is a pretty much a dupe. The Lip balm that comes with it is one of my FAVES). Nug Lip Mask--$7.99 (This dried on my lips instead of moisturizing them and then I had to rip it off my lips. It was torture, but a friend of mine had the opposite experience). Scary picture alert! This is me first thing in the morning with no makeup, so be kind! :) Behind the scenes blogging, right here! 1--It is impossible to apply neatly. 2--After I let it dry, I peeled it off. 3--Here's the after. It stays for hours! 24 K Mask--Get hydrated and glowing skin with gold. Bubble Mask--These turn from cream to bubbles on the face. Modeling Mask--One of the MOST unusual masks concoctions I've ever tried. It's a powder that you mix into something like pancake batter. Apply to face and it dries into a plaster-like shell. Bizarre! They have many different types, depending on needs. I tried two. Super fast weekend, mainly since I spent so much of Saturday out and about before the cooler temps hit yesterday. So much for that first day of spring! I actually don't mind it, but wish that pollen would go away. The wine mask sounds like something fun to try! 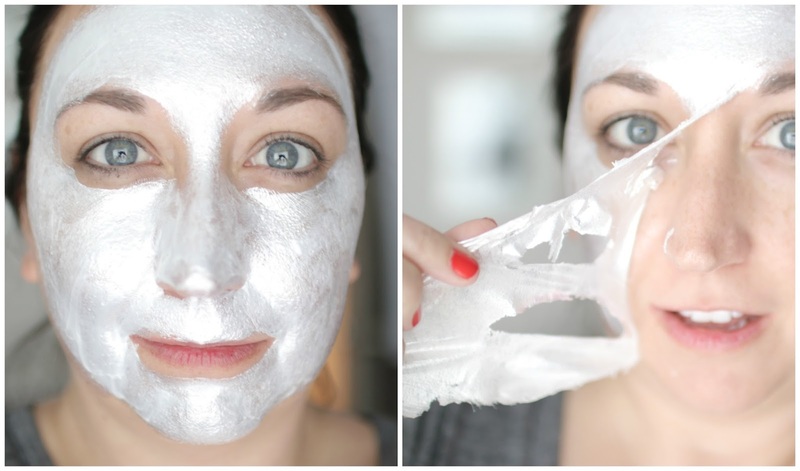 The Glam Glow mud mask sounds amazing and I love peel off masks! That lip peel off mask - WHAT? I've never heard of a thing! I buy masks but then am afraid of trying them with my skin being so sensitive. I need to experiment a little bit in them. I love a good mask. I need one for my lips for sure! Okay, I never buy masks or take the time to put them on (terrible, right?) but some of these sound pretty cool. Like the wine masks!? And I think my poor feet need the foot masks. ELLE, that mask has SNAIL mucus in it! Now I have read everything! Totally loving that GlamGlow peal off mask, looks like so much fun. Now I want to go and do one. I am not over the snail thing yet. Wow, just wow. Glamglow is my favorite! Babyfoot is SO gross, but it's a miracle worker! these are great.. thanks for sharing! All these masks sound so fun! I could use a foot one right about now to get my feet back in sandal wearing condition. Yikes!!! They really do have masks with some interesting ingredients. I'm not sure how I feel about putting snail extracts on my face though. The others I would try. 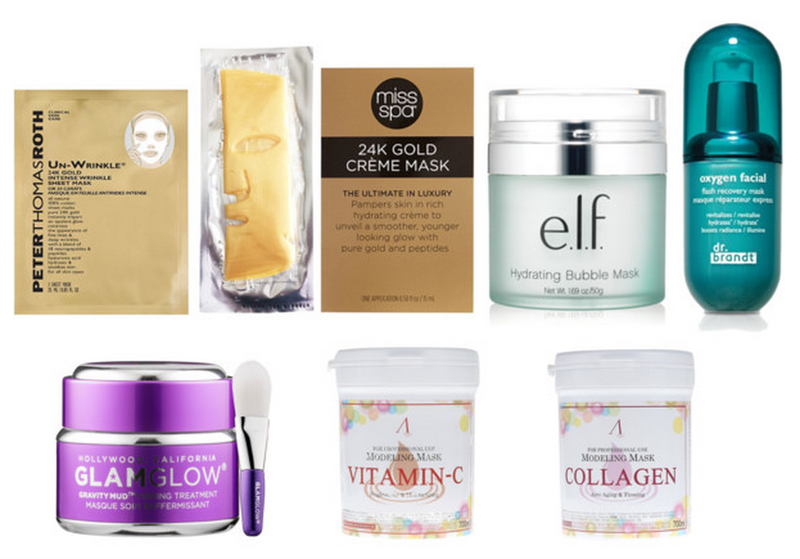 I would really like to try the egg masks and that silver peel off mask is pretty cool! I would prefer to try a sample of that if they had them since its a pretty expensive mask. The elf bubble mask is def on my list too. Thanks for sharing these Elle! The wine masks would be fun to do for a girl's night in. Also, I NEED to do that foot peel one before summer is here. My feet are a mess. Thanks for the reviews and you also look beautiful without makeup on! I love trying masks but never know which ones to actually try out. I think that snail one or the bee venom would be neat to try! Thanks for sharing these! I've been on the hunt for a decently priced vitamin C mask. Jotting this one down. (; I'm not a huge fan of the Tony Moly sheet masks. I think I wanted to love them, all the hype is there, but the only results I got were gone the next day. However, I highly suggest for you to try the Miss Spa brand sheet masks. (Target, Rite Aide). I got real hydration that lasted! I was so impressed I've been trying all the masks from that line. You will love them Elle! So crazy how many products are out there! I should try the foot ones, sounds kinda neat. LOL! The lip mask, stain thing...I don't think I could do that...sounds too messy. These are some interesting mask. Have a great week. I love face masks, the weirder - the better. Especially sheet masks are so much fun! Never got along with the foot masks though, it was always just messy and ineffective. Yessss! I finally can comment! Whew! I adore sheet masks because I am super lazy but I am definitely intrigued by some of these especially the modelling mask, how cool/weird is that? I'd try a mask. My daughter wants to do some. I'd try an egg mask--or really, whatever was on sale. Or cheapest. I'm cheap. oh my goodness! you had weird right! i have never seen the lip peel one, interesting. i am definitely intrigued by the wine one! Omg how cool! I havent heard of most of these masks! 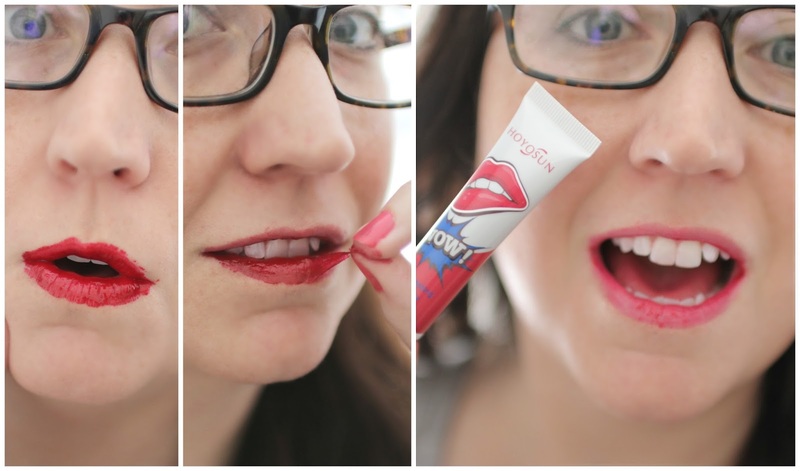 That lip one is so funky and I need to try the silver one! I've heard good things about the baby foot mask. I really want to give that one a try. Great idea for a post, Elle! I've been really into masks lately. Naturally, I'm drawn to your wine masks here! And wow, even a mask for feet? I want that! I want to try the elf bubble mask! I heard good things about the dr Brandt one too. Those lip masks that ledge color on your lips look so interesting lol!! 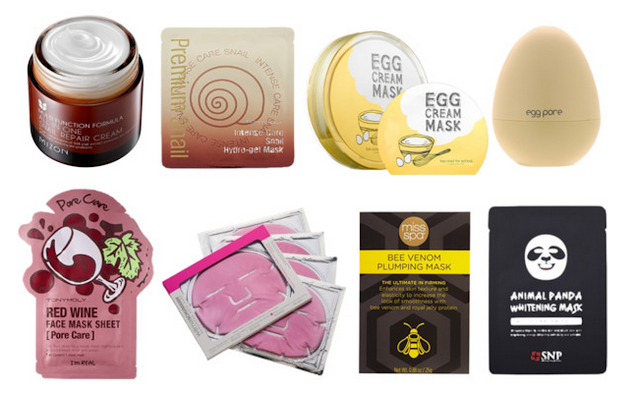 A lot of these masks sound neat, the packaging to the egg pores mask looks so cute. I had never heard of feet masks before, I'm going to have to keep an eye out for them here! My feet are in a terrible state with all the swelling they are doing in this summer humidity. Even though it's Autumn, Brisbane hasn't cooled down yet haha! Interesting assortment of masks. That lip mask looks pretty cool. I've seen the animal sheet masks floating around the interwebs. They're cute! Being in Asia we are definitely bombarded with different types of masks - I find them so hard to put on though..! They practically slide off or end up covering my eyes... HAHA I didn't know about the lip mask, interesting!! I used to do a mudd mask from Avon to try and get all that Xtra oil out of my skin. That lip mask thing is interesting. If you can't apply it neatly, then why would you want the color to last for hours? I just did a baby foot mask and I love how soft it makes my feet feel. I've seen the wine sheet mask at Ulta before and been intrigued but I've never picked it up. I was curious about the egg products that minimize pores because mine are huge and I'm all for anything minimizing them. I want to try all of these! The silver peel off and the lip peel off are the ones I want to try first! I love face masks! These sound great!! And the wine masks will be something I'll be trying soon. Retinol=awesome.